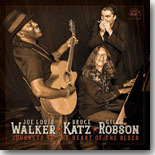 Veteran guitarist Joe Louis Walker teams up with keyboardist Bruce Katz and harmonica ace Giles Robson to take a blues trip, with Journeys To The Heart Of The Blues being this month's Pick Hit. Chicago guitarist Lurrie Bell gathers his family to put out a tribute to their father, the late harmonica ace Carey Bell, on the loving Tribute To Carey Bell, our Surprise CD this month. This month's Flashback takes a look at Delmark Records' 65th anniversary Tribute album. with some of Chicago's best contemporary blues musicians putting down new recordings of songs done originally by the label's many great, great artists. Our What's New section features new CDs from Deb Ryder, Barbara Blue, Bob Corritore, Billy Price, Big Harp George, Keeshea Pratt, Paul Filipowicz, Matty T Wall, and more.